Oscar Pistorius Movie Sparks Outrage: Is It Justified? The Oscar Pistorius trial had the world, particularly South Africans, glued to their screens as details about the murder of Reeva Steenkamp unfolded. In July 2016, Pistorius was sentenced to 6 years in prison for the crime and while most people thought we wouldn’t hear about the story for a while, a trailer for the Oscar Pistorius movie has made the topic relevant again. 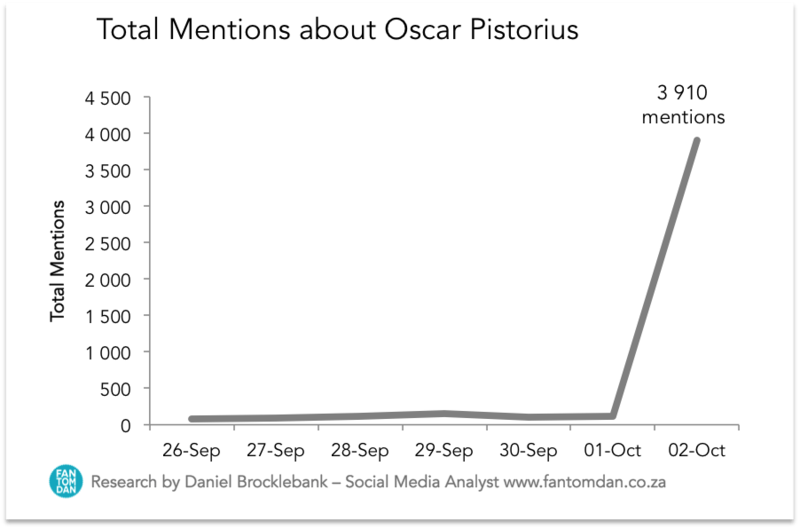 Mention of Oscar Pistorius had been minimal following the sentence, with only 4,562 online mentions in 2017. After the trailer surfaced on 2 October, social media has been abuzz about the topic, accounting for 86% of mentions about him for the year. 77% of mentions stemmed from South Africa, followed by the US (7%) and the UK with 5%. The remaining 11% were by individuals in other regions. Twitter was the most popular platform for opinion sharing and accounted for 93% of total mentions. News sources contributed 3% to volumes and other online platforms made up the remaining 4%. The trailer triggered outrage from South Africans who have taken their opinions to social media. The majority of posts were neutral as the majority of people reshared news about the trailer. Negativity largely centred around opinions about Oscar himself, however, others have voiced their annoyance at the American production company (Lifetime) for creating the film. I think this movie is unnecessary. Making a movie about #OscarPistorius like he's some sort of a hero. The #OscarPistorius movie is trash, I'll never celebrate a man who shot and killed his girlfriend on valentines day NO!!! The most prominent complaint though, is that the film was produced without the consent of either of the families. Numerous individuals voiced their anger at Lifetime for not consulting with the Steenkamp or Pistorius families regarding the portrayal of the characters or even requesting permission to shoot the film. The public has particularly jumped to the defence of the Steenkamp family, with media outlets highlighting this as the most noteworthy news. But, do filmmakers have a legal obligation to do so? According to legislature, no. There are no privacy laws preventing filmmakers from depicting real people, so long as the portrayal is not defamatory. While the movie is a dramatised retelling of the story, the trailer suggests that Reeva is portrayed in a favourable light. For this reason, it’s unlikely that the Steenkamp family will be able to take legal action. However, on 3 October, Carl Pistorius (Oscar’s brother) confirmed that he will be suing the producers for misrepresenting his brother by ignoring facts to lend itself to a more compelling movie. Time will tell if the Pistorius family will win against Lifetime, but my prediction is that Lifetime did its due diligence before even going into pre-production. The ethics around making money off of the tragedy is another conversation, but from a legal perspective, it appears that the narrative has remained fairly true to the original reports of what happened. The film is scheduled for release in the US in November but there is no indication whether or not the film will be released in South Africa. Previous article Katy Perry Versus Taylor Swift: Who’s Winning? Don’t Miss the Amazing Mo Magic!